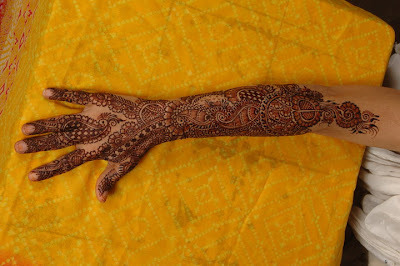 Front side of the bridal hand always has more imortance and the designer knows this ver well. The way that the designer adopt to put this beautiful Bridal Mehndi Design for Bridals is really fine and awesome. Designer use the same technique and theme on feet and legs as he/she use on hands. 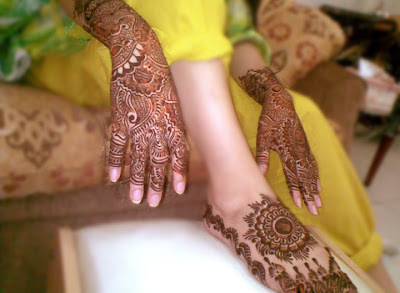 Mehndi Design has its cultural image In it and looks so cool. 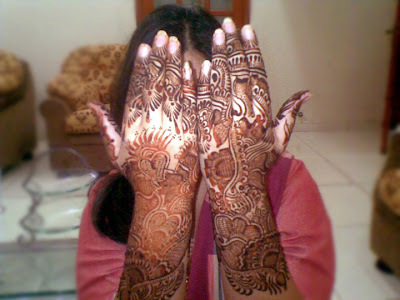 Lets have a look on this arabic Mehndi Design that she9 team choose for this Wedding season 2010-11. Arabic designs are more fine and that’s why have more fans. This Arabic Bridal Mehndi Design for the wedding season 2010-11 is very beautiful and the designer really works in a superb way. Front side of hands and arms along feet and legs have this gorgeous Mehedi Design. Bridal will shine after implementing this design. On hands designer use Large leaf style along tiny curvy lining style on fingers. Palm and the joint of the hand has leaf style and the on the arm designer use different technique that looks so beautiful. 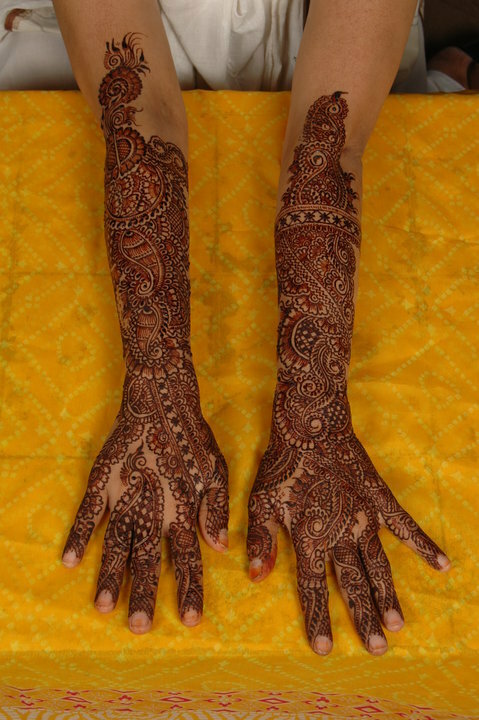 Designer implement Mehndi on arms in such a way that he/she created a double view and created a leaf style adjacent with curvy base of half circle whicj looks so beautiful. The design on feet and on legs is more beautiful and fine. Designer put very beautifully the branches of curvy lines and the put the nodes of flowers which looks so cool on fingers. On legs, the designer use same technique as he/she adopt on hands with a little change. 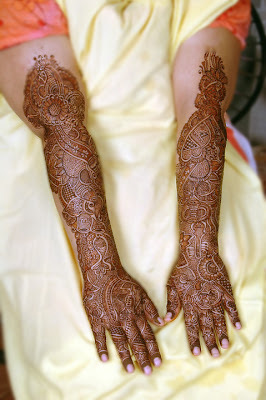 Following Bridal Mehndi design is the Indian copy of above Arabic Bridal Mehndi Design. 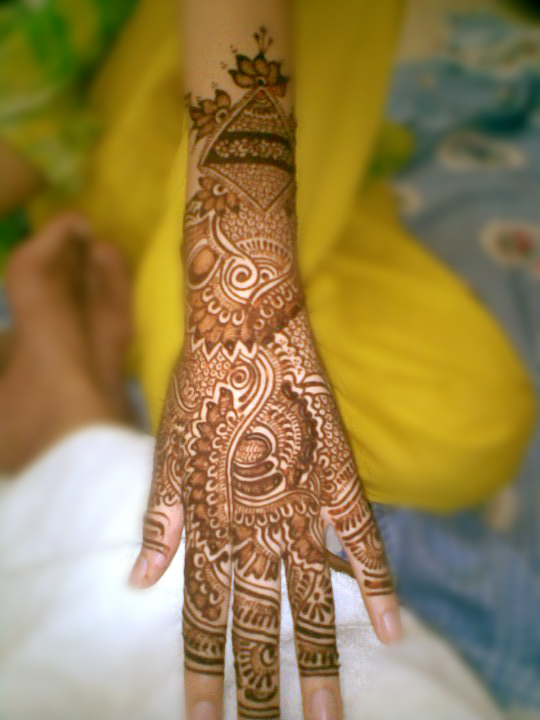 Designer did the little changes and makes this Mehndi Design more beautiful but in Indian style. If you look at the design carefully you will observe that the both Bridal Mehndi Designs are same with slight cultural changes. The 2nd phase of the design which the designer put on the back side of the hand of Bridal has less floweral but curvier lining style which gives gorgeous view. This design will shine you in this wedding season 2010-11. Don’t worry we recommend this Mehndi Design to those visitors who don’t have their weddings in this wedding season of 2010-11. The design is so beautiful and that’s why not only the bridals but all the participated girls can apply this design. Designer has use lining style on fingers and put floweral design of Mehndi at palms. At wrist the designer use small boxes with tiny flowers and at the top the designer created some floweral stuff to make this design more beautiful. 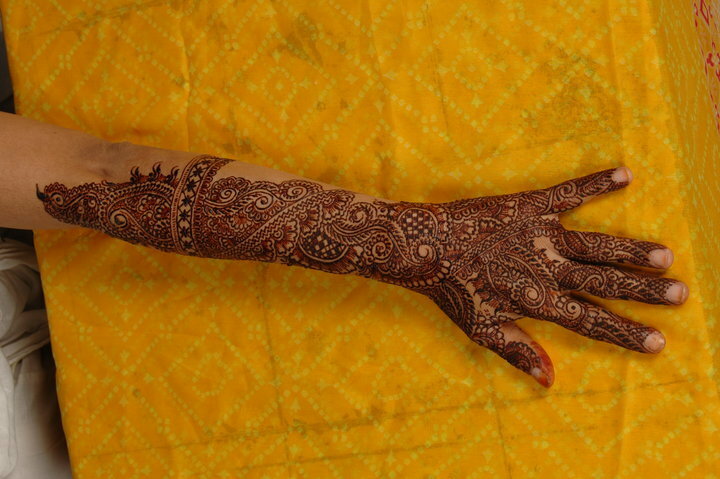 Very beautiful Indian Mehndi Design for the hands of a Bridal. If you are a victim of some allergic disease of skin and can’t put rich and thick Mehndi paste than this Bridal Mehndi Design would be a more powerful and beautiful for you. 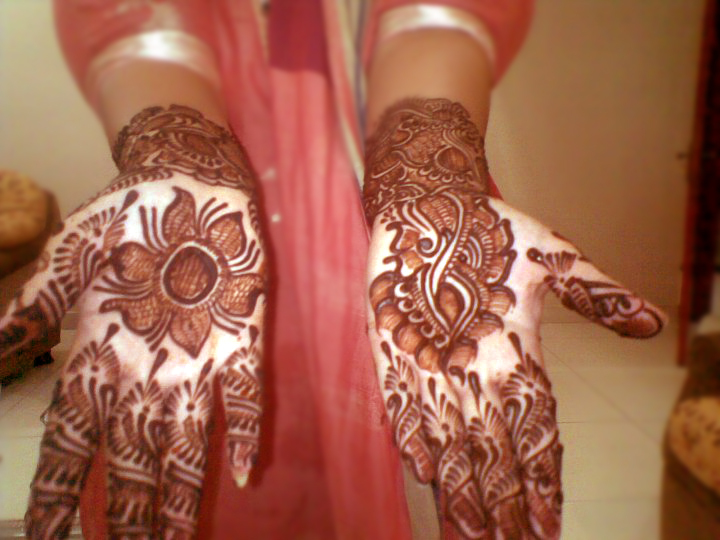 This Mehndi Design consists of floweral and leaf style combination and has zig zag lining style on fingers. 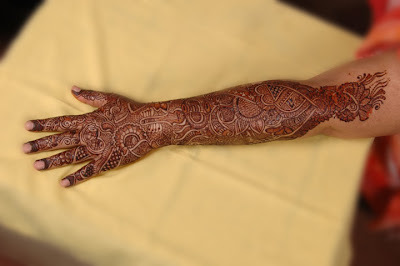 Following Indian Bridal Mehndi Design has cultural influence within itself and the designer also take very care about this thing and put the design in a special cultural way and include some images and cultural shapes in the design and finally implement this design in a superb way. The design has been implemented on both sides of the hands and arms. Such designs are really famous in rural areas and the girls who really likes to be like a traditional bride. This typical Indian Mehndi Design is really awesome and most of the brides will like such Mehndi Design because this has cultural image and these types of designs are very easy to put. Front side has small and large flowers combination with some curvy lining stuff. The back side of the bridal hand looks more beautiful as the design is so gorgeous and attracts more. Designer put flowers and leaf in such a beautiful way and finally constructs a very gorgeous and amazing Mehndi design. This Bridal Mehndi Design is really fantastic and will be the best Bridal Mehndi Design for this Wedding Season 2010-11. 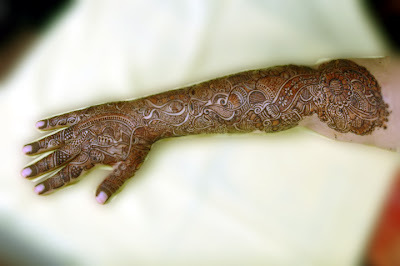 This is very beautiful Pakistani Bridal Mehndi Design. The typical Pakistani way to put Mehndi Design and this has simplicity in it which attracts others. Simple combination of flowers leaves and branches make finally the best Bridal Mehndi Design. Another beautiful Pakistani Mehndi style is front of you. Pakistani Mehndi style has a specialty that the design has more worth and more stylish stuff than others as the designer also use different style for both the hands. We are living in a modern age and everything facing its change phase due to technology advancement. Although putting a Mehndi paste and creating the Mehndi Designs is not a technical thins but the use of other things along with Mehndi paste make this more beautiful. People use some shiny stuff like glitters especially for Bridal Mehndi and this ting appreciated in all over the world. Here we present you some gorgeous designs of shiny stuff for Brides. The design consists of flowers and leaf combination and designer prolong this design to the upper side of the arms. The speciality of this bridal Mehndi design lies in the use of motif and shiny glitter which make the design more beautiful and powerful. In this design designer use colorful glitter along traditional Mehndi paste which gives more beautiful sensation to the viewer. 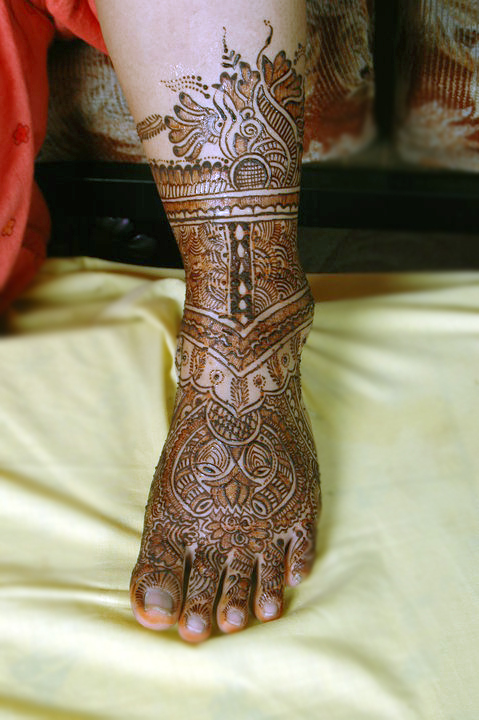 Simple but beautiful Mehndi Design on foot also the part of this Bridal Mehndi Design package. Designer also uses glossy and blooming glitter for this design. Following are the typical Indian Bridal Mehndi Designs for this wedding season of 2010-11. All the designs have good work and beautiful theme and use of different shape of flowers and leaves along with lining stuff. Designer did his/her best and make these all the best for this wedding season. This design has some cultural and traditional stuff as you observe some shapes have typical Indian style and format. Don’t forget that Mehndi is also a tradition and cultural object of Indian Culture. 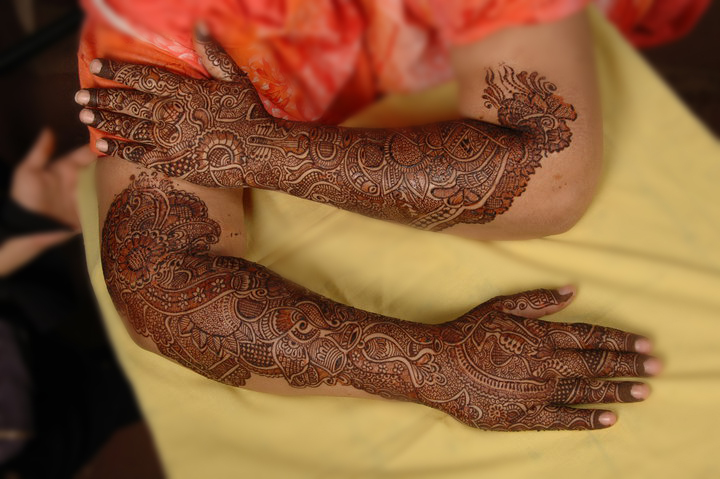 Typical Indian Bridal Mehndi Designs shines gorgeously. This design is really awesome and most of the brides will like this. 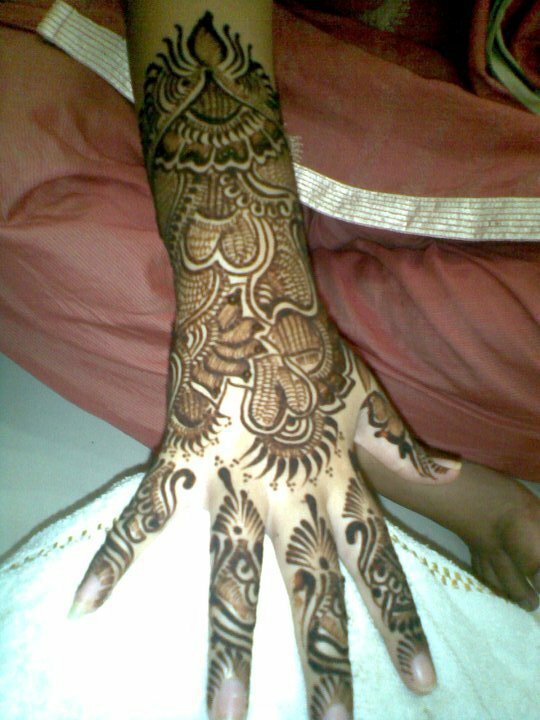 Another gorgeous and stylish Arabic Mehndi Design here for the brides of this season 2010-11. Very nice and fine work of the designer and the style also looks so amazing. Designer put beautiful floweral theme along with curves and finally the overall design gives gorgeous look. Front side has more rich design and has more beautiful theme. Back side of the hands and arms also has a series of beautiful flower series and overall design has strong symmetry of style that gives more beautiful sight to the viewer. Very thin and fine use of Mehndi Paste is the speciality of Arabic Mehndi Designs. This Arabic Bridal Mehndi Design also has fine and norrow use of Mehndi paste and the designer finalized the design in a very beautiful way. Fingers, palm, front side of the hand and arm and the back side of the arm all the designs have beautiful and amazing use and separation of lines and stlyles which gives a very powerful design to us. 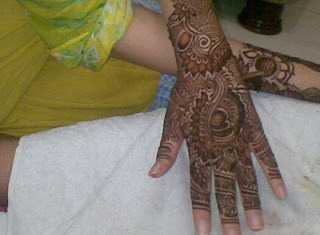 This is the Bridal Mehndi Design of this wedding season of 2010-11 by the she9 team. The design is really awesome, the design, the theme and the way to put the Mehndi paste and the implementation and the presentation all the things are superb and on merit. The design has rich style on both sides of the hand but looks so pretty and simple because designer implements this style in very fine way. Leaf style along with different themes of shapes gives interesting and beautiful sight to the user. 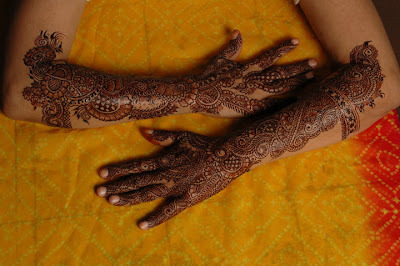 Hope you will like and appreciated all the Bridal Mehndi Designs for this Wedding Season of 2010-11. All these Mehndi Designs are taken from an official user of facebook . Mona is a best mehndi designer specially in wedding and body tattoos for parties. All these gorgeous mehndi designs are published with approval.